James D. Julia's February Winter Fine Art, Asian & Antiques Auction Rings in the 2017 Sales Season with Over $3.2 Million! This world-class, two day sale featured a breathtaking collection of highly curated fine and decorative arts, outstanding antiques and furniture, historical rarities, and Asian selections. 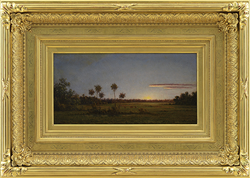 Martin Johnson Heade's Florida Pastoral Realized $359,000. James D. Julia’s annual February sale truly was a feast for the senses, tempting bidders with nearly 1,200 lots of paintings, sculptures, furniture, historical artifacts, and other surprise rarities. After the hammer fell for the last time, 38 lots realized $10K or above. In addition, 19 lots realized $25K or more, and 1 lot broke the six-figure mark! Lot #1125, Martin Johnson Heade’s Florida Pastoral was this auction’s big winner. Estimated at $300,000-500,000, it brought $359,000. This remarkable work was acquired from the family of the artist and was included in Heade’s catalogue raisonné. Other museum quality works by American artists also deserve the spotlight. 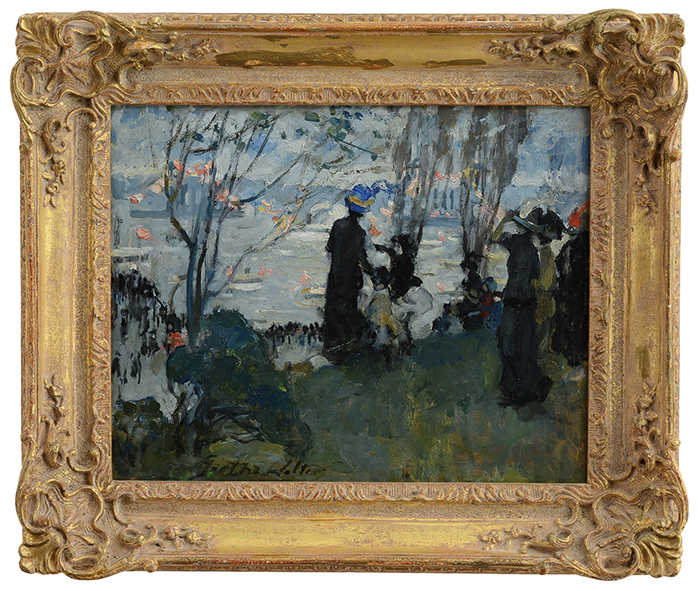 Lot #1124, Martha Walter’s Along the Seine Celebrating Bastille Day, was estimated at $15,000-20,000 and realized $31,460. Lot #1182, Norman Rockwell’s Hot Toddy was estimated at $20,000-40,000 and made $45,980; the illustration was used in 1949 for an advertisement in The Saturday Evening Post for Schenley Whiskey. Lot #1147, Hayley Lever’s Red, White, And Purple Gladiolas was estimated at $10,000-20,000. It blossomed at more than twice its high estimate to realize $44,770. Lot #1198, Thomas Moran’s A Hillside Village at Sunset shone brightly at $51,425; it was originally estimated at $30,000-50,000. And a big surprise in this category was lot #1104, Edward Hill’s Panoramic View of The Mount Washington Valley. Estimated at $1,000-2,000, it reached its summit at $16,940. This comprehensive sale featured a boatload of outstanding, nautically themed paintings. 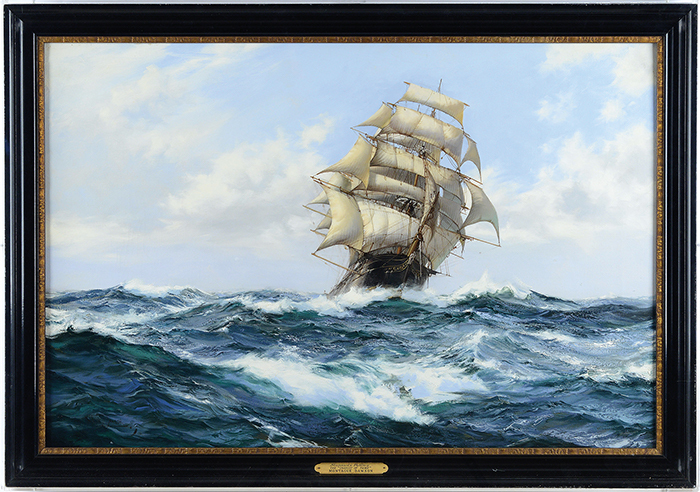 Two works by Thomas Hoyne were unsinkable. The first, lot #2127, his Eliza Adams more than doubled its low estimate to realize $54,450. And the second, lot #2128, his Setting the Jib, The Puritan of Gloucester swelled to $18,150 on an $8,000-12,000 estimate. Lot #2080, James Edward Buttersworth’s View of Ryde And Pier, Isle of Wight, Opposite Portsmouth was estimated at $20,000-30,000 and realized $33,275. Lot #2240, J.B. Smith & Son Portrait of The Brig Young Republic, T.L. Libby Comd. New York, September 3, 1859 made waves at $29,040, nearly three times its low estimate. And lot #2181, Montague J Dawson’s The Chariot of Fame, Stunsails Pulling was estimated at $25,000-35,000 but took its victory lap at $78,650. a rare pair of celestial and terrestrial globes by John Senex (1678-1740) truly launched bidders into orbit. Estimated at $30,000-50,000, they landed at $51,425. And three’s a charm with lot #2059, an American coin silver porringer By Jacob Hurd and two tankards by William Whittemore. This trio was estimated at $2,500-3,500 but realized a sterling $13,915. Asian art, including paintings, sculptures, artwork, cloisonné, and porcelain, was another strong category in this sale. Things were twice as nice with two lots of calligraphy couplets. 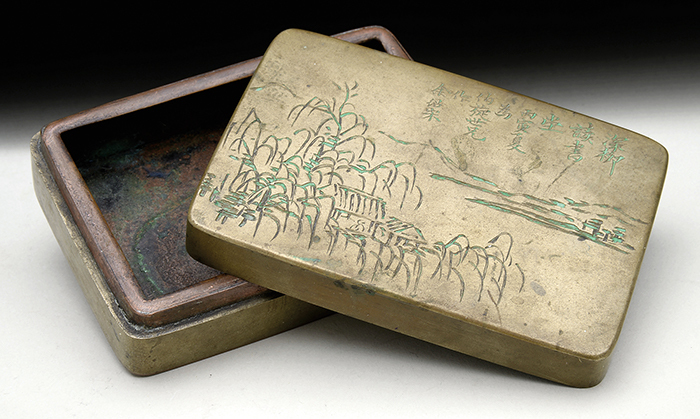 The first, lot #1600, a pair signed by Zuo Zongtang, was estimated at $8,000-12,000 and realized $30,250. The second, lot #1602, a pair signed by Li Hongzhang, was estimated at $5,000-7,000 and realized $26,620. Lot #1537, a Yoshimitsu bronze Okimono of a standing archer, was estimated at $5,000-10,000 but hit the bullseye at $24,200. This Meiji-period masterpiece depicts a Samurai with his extended arm holding a bow and ready to fire. Collectors seemed interested in putting a lid on lot #1564, a covered ink box signed Yu Shaosong. Estimated at $2,000-4,000, it made its mark at $36,300. And a smaller, unassuming Asian lot clearly had the “X Factor” with bidders. Lot #1612, a white glazed stoneware bowl with reserves of blossoms in relief surrounding a four character mark was estimated at $200-400 and made $3,751. Choice antique and important furniture has always been signature categories for Julia’s. This sale featured a number of Queen Anne and Chippendale heavy hitters. Lot #2109, a 1750 Queen Anne transitional mahogany blockfront bureau table was estimated at $20,000-30,000 and made $29,040. This rare and handsome example was made of high grade Santo Domingo figured mahogany and probably from Salem, Massachusetts. Lot #2132, a c. 1775–1790 figured mahogany secretary bookcase was estimated at $5,000-8,000 and sold for $21,780 - more than four times its low estimate. This particularly bold blocked end serpentine example was detailed with robust claw and ball feet and a center drop. 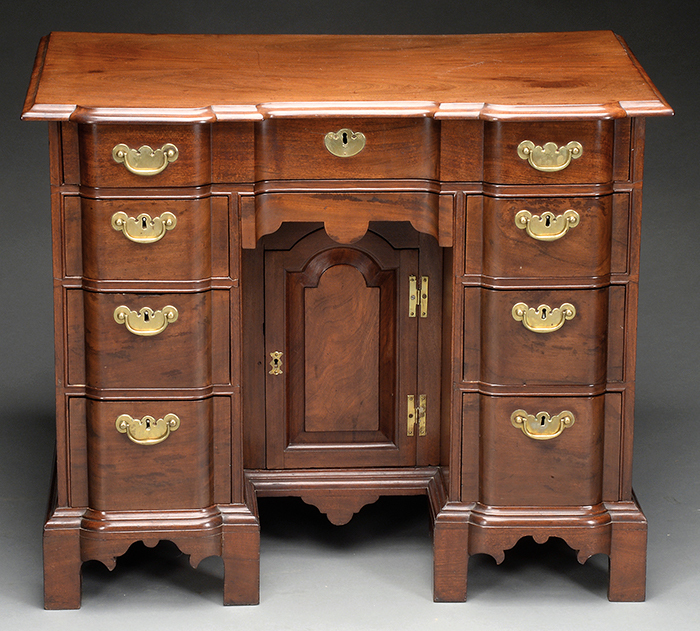 And lot #2327, a Chippendale tiger maple secretary bookcase estimated at $6,000-9,000 roared to $16,940. It wouldn’t be a Julia’s auction without some remarkable historical items, archives, and flags, and this sale more than delivered in these important areas. Lot #2021, an archive of materials from the Confederate Secretary of the Navy, Stephen R. Mallory, was estimated at $8,000-12,000 and made $84,700. This grouping included a portrait of Mallory, three copies of his diaries, his appointment signed by Confederate President Jefferson Davis and Secretary of State William M. Browne, and a small sword with regimental markings. Lot #2033, a rare "Inverted Great Star" Abraham Lincoln funeral flag was estimated at $4,000-6,000 and sold for $20,570. And lot #2016, 12-star Confederate exclusionary flag also shined brightly in this category, realizing $11,193. It was originally estimated at $2,000-3,000. Finally, everyone knows by now to expect the unexpected at Julia’s semiannual Fine Arts, Asian and Antiques auctions. This sale included a number of outstanding, unusual and really interesting items that just didn’t fit cleanly into any category. Case in point, there was music in the air with lot #2394, an outstanding 1961 Fender Stratocaster electric guitar with a sunburst finish. Estimated at $3,000-5,000, it more than tripled its high estimate to realize $15,730. 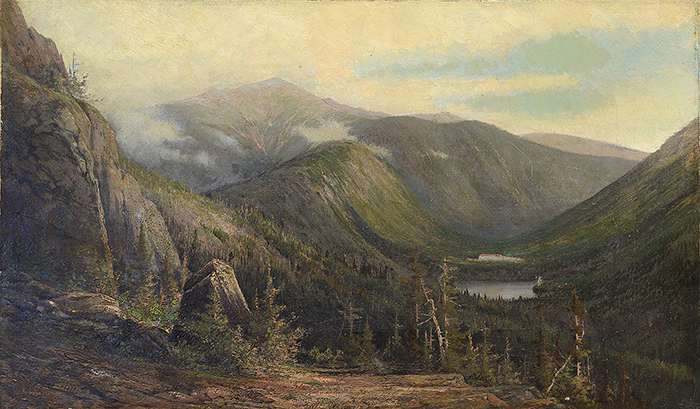 Edward Hill's Panoramic View of the Mount Washington Valley Realized $16,940. Martha Walter's Along the Seine Celebrating Bastille Day Realized $31,460. 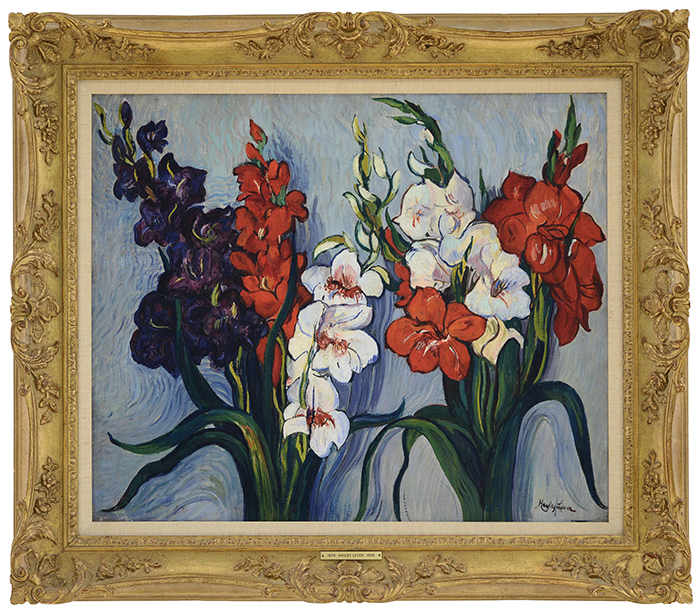 Hayley Lever's Red, White, and Purple Gladiolas Realized $44,770. 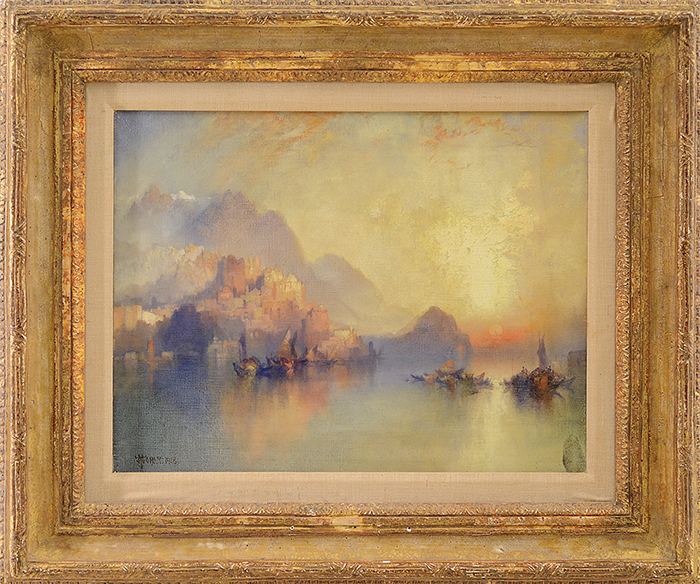 Thomas Moran's A Hillside Village at Sunset Realized $51,425. 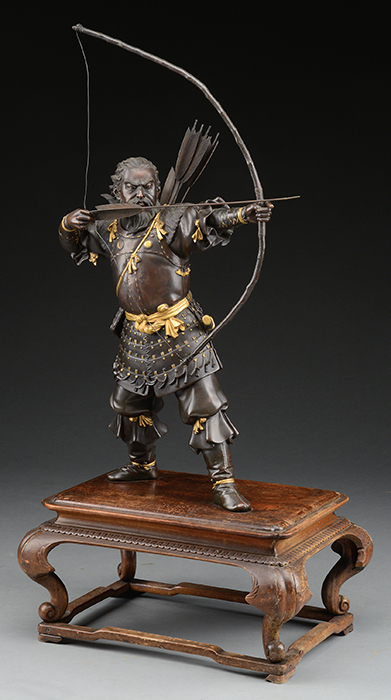 Yoshimitsu's Bronze Okimono of a Standing Archer Realized $24,200. Covered Ink Box Signed "Yu Shaosong" Realized $36,300. Calligraphy Couplet Signed "Zuo Zongtang" Realized $30,250. 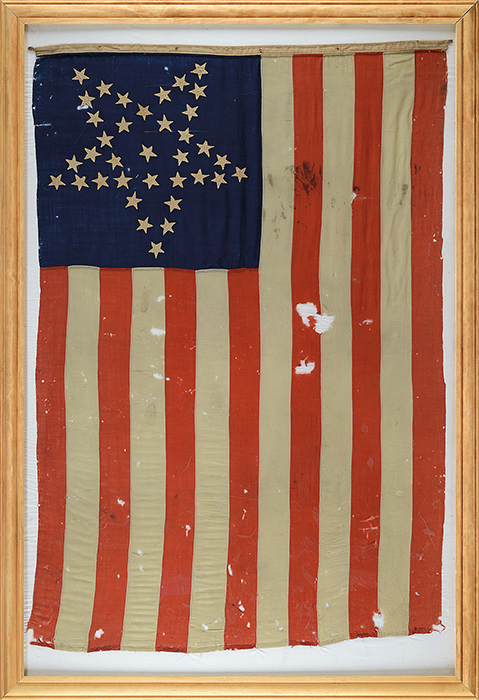 Rare "Inverted Great Star" Abraham Lincoln Funeral Flag Realized $20,570. 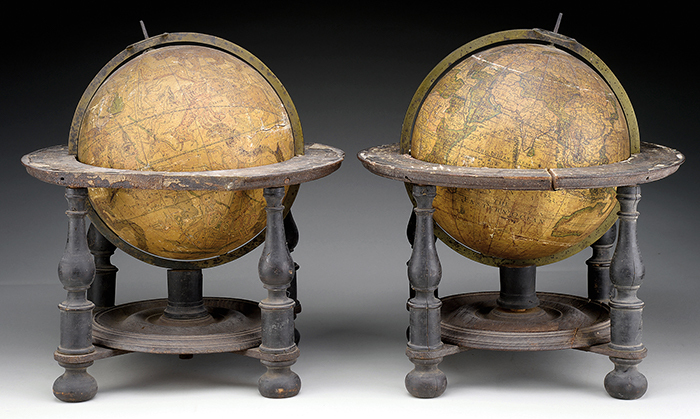 Pair of Celestial and Terrestrial Globes by John Senex Realized $51,425. Queen Anne Transitional Mahogany Blockfront Bureau Table Realized $29,040. Thomas Hoyne's Eliza Adams Realized $54,450. 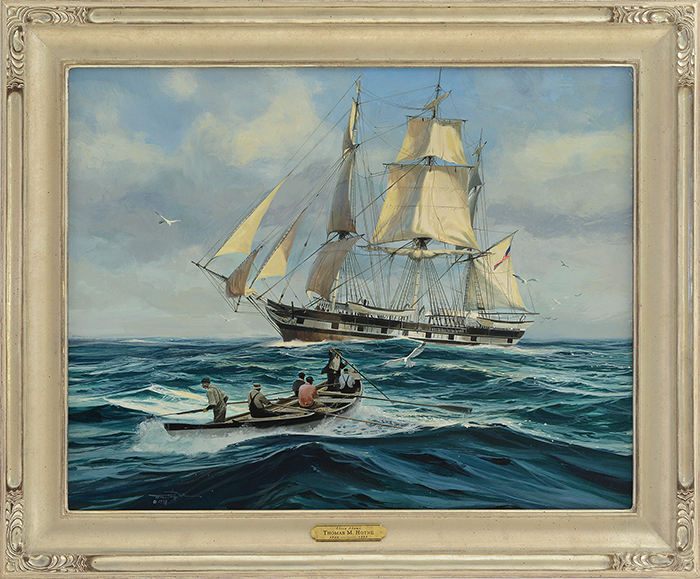 Montague J Dawson's The Chariot of Fame, Stunsails Pulling Realized $78,650.